Edward Weston was an influential photographer of the 20th century. With his efforts, he helped people see photography as an art. The type of photographs in which Weston specialized are called “straight photography,” where no unusual effects are done to change the image of the photograph. 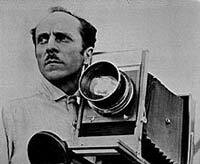 Edward Weston was born in Highland Park, Illinois, on March 24, 1886. His mother died when he was only five, so he was taken care of by his sister, Mary, whom he would often call “May.” The relationship Weston had with his sister was one of the few steady relationships he had in his whole life. Weston attended his early schooling at Oakland Grammar School in Chicago. When he was 16, his father gave him his first camera – a Bull’s Eye #2. Weston captured his first photographs on his aunt’s farm and in the parks of Chicago. In 1906, Weston moved to California and worked as a door-to-door portrait photographer. From 1908 to 1911, he studied photography at the Illinois College of Photography and later opened his own portrait studio in Tropico, California. In the beginning, the works of Edward Weston were soft-focused, pictorialist in style, and painterly. However, after attending the San Francisco World Fair in 1915, he was greatly influenced to use different techniques and renew his vision in photography. Weston found great commercial success in photography in the next few years, and he also won many prizes for his works. Though Weston succeeded in his photography career, he always struggled financially. He became a member of the London Salon in 1917. Five years later in 1922, Weston met Paul Strand and Alfred Stieglitz. The same year, Weston’s life took a dramatic turn from soft pictures to images that were sharply focused with powerful compositions. He also burned most of the negatives that he took before 1922, showing that he only wanted to be remembered for his later works. Edward’s marriage with Flora Chandler came to an end in 1909. In 1923, he moved on to Mexico and opened a studio with Tina Modotti, both his lover and an artist. It was at this time when he started to keep journals, which he often referred to as “day books.” Until 1943, he wrote everything in day books and in 1961, Nancy Newhall edited and published these books for the first time. Weston started to earn reputation by 1925 as an artist and then later as “the California Photographer.” He returned back to California and started a new studio with his son, Brett Weston, in San Francisco. Finally, the studio was shifted to Carmel, where Weston thought he would spend the rest of his days. In 1932, the famous f/64 group was formed with the help of Weston and Ansel Adams. In 1937, he was the first photographer to obtain a Guggenheim fellowship. Though Weston worked mainly in silver and platinum and only in large formats, he did experiments with color photography in his later stages of life. Edward Weston was stricken with Parkinson’s disease and he relied on his sons for printing his films. His youngest son, Cole, became his assistant and in 1952, he and Brett created their father’s “50th Anniversary Folio.” Weston died in 1958 in his home and Cole fulfilled his father’s wishes and continued to print his negatives.